오늘 전해드릴 소식은 유학넷을 통해 유학 간 이해지 학생의 반가운 소식을 전해드리려고 합니다. 해지학생은 14기 교환학생으로 저희 유학넷과 첫 인연을 맺은 학생인데요. 현재는 세인트 루이스의 대학원생으로 언어 병리학자를 꿈꾸며 공부를 하고 있습니다. 자세한 내용은 잡지에 실린 내용을 통해 전해드리도록 하겠습니다. 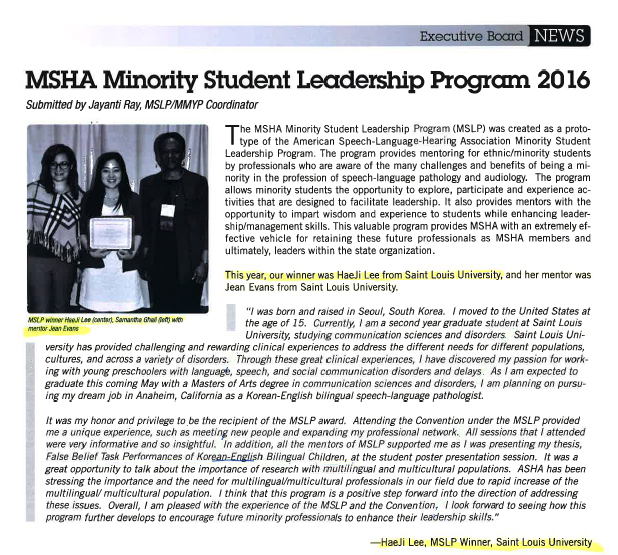 ﻿Submitted by Jayanti Ray, MSLP/MMYP Coordinator The MSHA Minority Student Leadership Program (MSLP) was created as aproto-type of the American Speech-Language - Hearing Association Minority Student Leadership Program. The Program provides mentoring for ethnic /minority students nority in the profession of speech-language pathology and audiology. The program tivities that are designed to facilitate leadership.It also provides mentors with the opportunity to impart wisdon and experience to students while enhancing leader-fective vehicle for retaining these future professionals as MSHA with an extremely ef-fective vehicle for retaining these future professionals as MSHA memvers and ultimately, Leaders within the state organization. This year, our winner was HaeJi Lee from Saint Louis University, and her mentor was Jean Evans From Saint Louis University.
" I was born and raised in Seoul, South Korea.I moved to the United States at the age of 15. Currently, I am a second year graduate student at Saint Louis Versity has provided challenging and rewarding clinical experiences to address the different needs for different populations, ing with young preschoolers with language, speech, and social communication sciences and disorders, I am plannin on pursu-ing my dream job in Anaheim, California as a Korean-English bilingual speech-language pathologist. It was my honor and privilege to be the recipient of the MSLP award.Attending the Convention under the MSLP provided me a unique experience,such as meeting new people and expanding my professional network. All sessions that I attended were very informative and so insightful.In addition, all the mentors of MSLP supported me as I was presenting my thesis, great opportunity to talk about the importance of research with multilingual and multicultural populations. 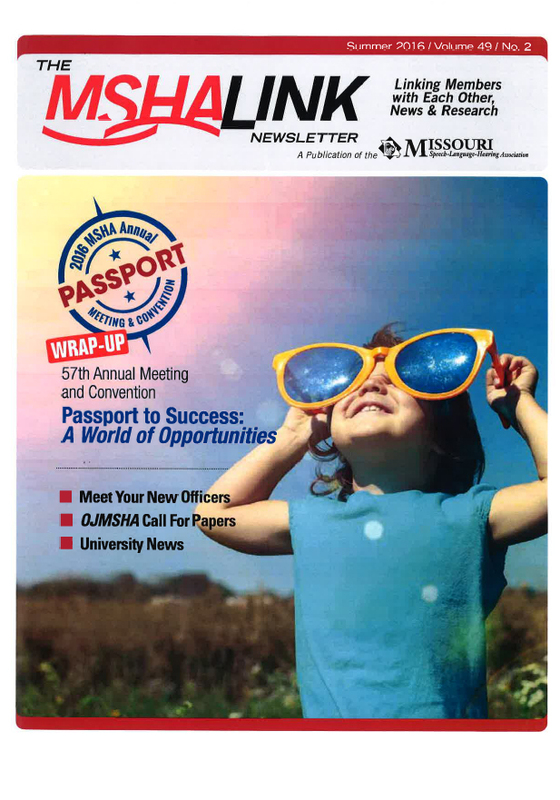 ASHA has been multilingual / multicultural population.I think that this program is a positve step forward into the direction of addressing these issues.Overall, I an pleased with the experience of the MSLP and the Convention. I look forward to seeing how this program further develops to encourage future minority professionals to enhance their leadership skills." 교수의 멘토링을 통해 소수 민족 학생들에게 제공한다. 리더쉽을 용이하게 사용할 수 있도록 해준다. ​또한, 지도력과 경영력을 강화하면서, 학생들에게 지혜와 경험을 부여 할 수 있는 멘토를 제공해 준다. 그녀의 멘토 담당은 같은 대학 출신의 Jean Evans 다. “저는 대한민국 서울에서 태어나 자라 왔습니다. 15살 때, 저는 미국으로 넘어왔죠. 현재, 저는 세인트 루이스의 2년 대학원생으로서 의사 소통학과 장애(Communication sciences and disorders)에 대하여 공부하고 있습니다. 지내면서 이에 대한 제 열정을 발견하였습니다. 이번 MSLP의 수상자가 되는 것은 저의 영광이고 특혜입니다. 저에게 독특한 경험을 제공해 주었습니다. 제가 참석한 모든 세션은 매우 유익하고 중요했습니다. ​더하여, MSLP의 모든 멘토들은 제가 저의 논문인 ‘False Belief Task Performances of Korean-English Bilingual Children’의 이론을 준비하는데 큰 도움을 주셨습니다. 이는 다국어와 다문화 주민 조사의 중요성에 대하여 이야기 할 수 있는 좋은 기회였습니다. 저는 이번 프로그램이 이러한 이슈들을 다루는 방향에 긍정적인 발걸음이라 생각합니다. 지금까지 이해지 학생의 소식을 전해드렸고요.